Visiting Place in Dhemaji District in Assam. Here Some Best Place to visit in Dhemaji District. Dhemaji located on the north bank of the river Brahmaputra. Arunachal Pradesh to the Noth and the East, Lakhimpur district in the West and the River Brahmaputra in the South. The district occupies an area of 3237sq.km. History - 1240 A.D the first king of Ahom reign Chow Chukafa established his capital at the place name of Haboong in Dhemaji District. Due to flood in the area, Ahom King Chow Chukafa shifted the capital from Haboong after that the area rule under the Chutias from 1123 to 1523 A.D. During 1523 A.D Ahom King Chuhung Moong attacked and kill the Chutia king Natipal and area become again under of Ahom Kingdom. 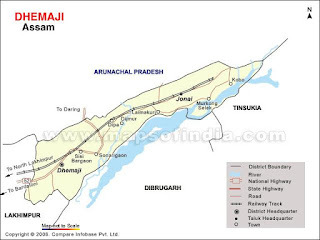 Dhemaji District area was originally inhabited by various indigenous tribes like Mising, Sonowal Kachari, Bodo Kachari, Deori, and Laloong. In addition to this different tribes example - Ahom, Rabha, Tai, Khamti. Konch, Keot, Koiborta, Brahman, Kayastha, Kalita etc. The place to Visit in Dhemaji District. 1) Gerukamukh - Gerukamukh is one of the most beautiful picnic spots located at a distance of 44 KM from the District head Quater in North-west direction. Regular Communication is available from Lakhimpur and Guwahati. At Gerukamukh Sobansiri the plains from the hills giving a scenic beauty with its virginity. Subansiri is the largest tributary of Brahmaputra river. National Hydro Electric Power Corporation is implementing a mega hydro electric power Project at Gerukamukh. 2) Malini Than - This place has been using for worship to the Goddess Malini since ancient time. Lots of historical monuments have also been excavated from the spot. It is located 42 km away in the northeastern direction of Dhemaji. 3) Ghuguha Dol - It is historically believed that at this place Bamuni Konwar The son of then Ahom King Tyao Khamti was born. The Dol (Temple) Was built in the memory of Bamuni Konwar's mother Ghuguhi and is at a distance of 17 km in south-west of Dhemaji. 4) Maa Manipuri Than - This Than (i.e. place of worship) distance of 25 km in the south-west direction of Dhemaji was established by the then Ahom King Gourinath Singha as a monument of help by the Manipuries in controlling Mua-Mariah renaissance during the later period of Ahom reign.